The biggest festival of the year at Tokyo Dome, Furusato Matsuri Tokyo, is back again this year, from Friday, Jan 12 to Sunday, Jan 21. Furusato Matsuri is a highly popular event that has been held annually since 2009, with fans and visitors steadily increasing each year. 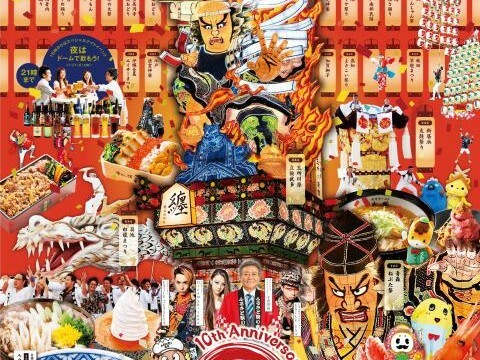 The event showcases a huge number of food stalls serving regional cuisine gathered from throughout Japan and an exciting selection of the hottest matsuri performances. In celebration of the New Year, come visit Furusato Festival Tokyo 2018 and experience the rich traditional culture and mouth-watering food of Japan. This is the event to be at, if you're interested in Japanese delicacies. Hours: 10 a.m. to 9 p.m. (Excluding Sunday, Jan 21 when it is open until 6 p.m. Last entry for this day is 30 minutes prior to closing time). *All ticket prices are tax included. *There will be no refunds for purchased tickets.